On Thursday, Girls Inc. of the Greater Capital Region (Girls Inc.), LifePath (formerly Senior Services of Albany), and the Northeastern Association of the Blind at Albany (NABA), cut the ribbon on the newly renovated building at 80 Central Avenue in Albany. This endeavor allows the three Capital Region non-profit organizations to share resources and serve the community in a larger capacity. NABA assists individuals who are blind or visually impaired achieve independence. The organization owned the 8,300 sq. ft. underutilized property for many years and had been searching for another non-profit organization to fill the building’s vacancy. Girls Inc. moved its offices from 301 Washington Ave, space shared with NABA, to 80 Central Avenue. Made possible with support from many, by building out the two unfinished floors of the property it allows the three organizations to maximize the available space. Facade renovations of the building were supported by the City of Albany Small Business Facade Improvement Program, a program made possible with support from the Albany Community Development Agency and the City of Albany Capital Resource Corporation. With daytime programming for seniors and after-school and evening programming for girls grades K-12, the new community center will now be fully utilized. 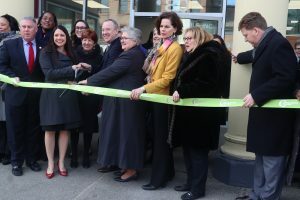 The shared resources of the three organizations connects their missions, and provides opportunities for intergenerational programming to support the lives of children, seniors, and the visually impaired.